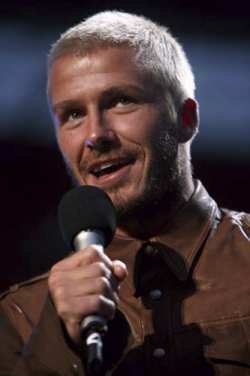 Soccer ace David Beckham basks in his status as a gay icon, insisting he's proud to be a pin-up for men who desire him. The L.A. Galaxy hunk is so comfortable with his sexuality, he never recoils when a lusty homosexual casts an amorous glance in his direction. He says, "I'm very honoured to have the tag of gay icon". And Beckham also admits his Spice Girls wife Victoria is responsible for his fashion choices - and always has his clothes laid out ready for him before he goes to bed. He adds, "Without a doubt, Victoria has a huge part in the way I look these days. I'm very organised and controlled, and need to go to bed at night knowing what I'm going to wear the next morning".